These perennial herbs have rhizomes, which are aromatic when cut with a ginger smell; leaves are 2-ranked, hairs are lacking. Flowers are borne in an inflorescence more than 10 cm long at the end of a cane 2-3 m long; the perianth is basically white but the bilobed labellum is yellow on the inside with red to orange markings. The globose fruit is red. 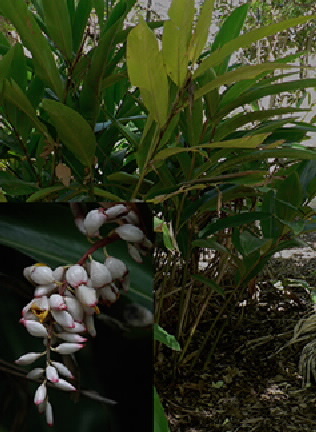 The native species growing along Half Moon Creek is Alpinia caerulea (Native Ginger). This species has white flowers and blue fruit.